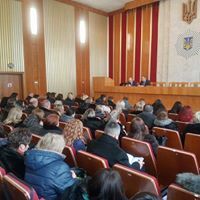 On February 5, 2018, an expanded meeting of the UMSA of Ukraine in the Volyn region took place with the participation of the leaders and all employees of the territorial divisions. Ivan Voitsyzuk, the Head of the Department, opened the meeting and informed the participants about the main tasks facing the LCA in 2018, recognized by the board of the Ministry of Internal Affairs of Ukraine on January 27 of the current year. Also, the head drew special attention to the organization of work on the issuance of a passport of a citizen of Ukraine for traveling abroad and passport of a citizen of Ukraine in the form of a card (ID). He brought to the audience the shortcomings in the work and the main issues. The First Deputy Chief Alexander Pakholyuk brought to the present the results of the work on the detection of foreigners and stateless persons who are illegally in the territory of Ukraine, emphasized the proper interaction with the police units in order to identify and prevent ethnic crime, terrorism and other criminal groups which include foreigners or stateless persons. The main expert on the prevention and detection of corruption of the UMSS of Ukraine in the Volyn region acted as a speaker on the prevention and detection of corruption on the theme "Fighting corruption - a priority task on the way of implementing the European choice of Ukraine".